Gypsy Woman by Joe Bataan sets the tone in her studio, a carefully curated creative hideaway. Her works line the walls with primary color and unexpected shapes, also known as her Lexicon Series. The artist's think tank is a place without rules - all bets are off, all mediums are welcome. This is because Mary Elizabeth Yarbrough creates à la Frank Stella. She's daring and experimental, refusing to limit herself to just one thing. Her curiosity is to blame for her range of skills sets, which includes everything between acrylic cutting and garment construction. Materials, tools, and crafts cover every surface, as Yarbrough is also preparing for her October solo exhibition at Black & White Projects in San Francisco. The artist floats into her creative space and arranges her most recent works, large acrylic pieces that are bright and organized, unique yet incredibly relatable, must like herself. MO: I can’t think of anything these pieces remind me of. Where do you draw your inspiration? MO: When you need to find new inspiration, or break out of a creative rut, where do you go? MEY: That’s when I usually go on a really long walk. Sometimes looking at books or my computer or processing content doesn’t help me get out of my head, the very place I need a break from. Movement really helps me. I love walking because it’s so straight-forward: I can start from anywhere and it requires nothing of me but the realization that I need a change of scenery. Walking helps me to lay out or process my thoughts while engaging with the world physically. My favorite long walk to take locally is along Ocean Beach. MO: Cutting acrylic is such a unique (and not easy I'd imagine) craft to master. Does working with it and figuring out how to make what you want give you a chance to zone out and ease the mental rut? MEY: Yes to the figuring out how to make what I want to make. When I’m drawing the pieces that will get cut, I’m really focused and it’s a very fun process for me. 4 hours will pass and I don’t even realize it. I love that. Everything I’m drawing is black and white but I’m thinking in colors and the transitions in the forms that will be translated in acrylic. That part is meditative. The actual laser cutting is less so. That bit can be a more tedious when it comes down to it but I’m not complaining. It’s part of the process and the whole process from start to finish is pretty satisfying. MO: How long have you been making things? MEY: It’s accurate to say I’ve been making things since I was a child, but it wasn’t until I moved into an apartment as a young barely adult and had no furniture that I really began making things in earnest. I started with furniture and welding and that led to a lot of other tools and practices. MO: What’s your idea of success as an artist? 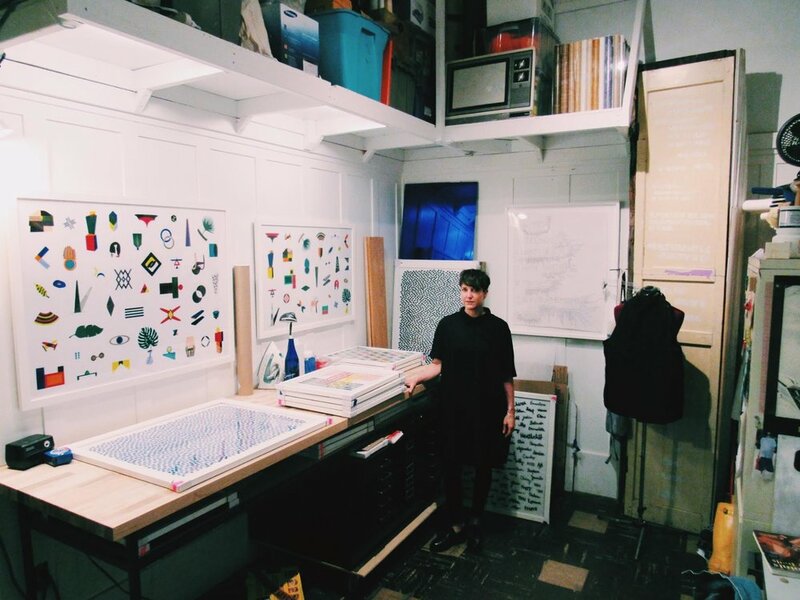 MEY: For me, success is being able to be in the studio every day; to have the luxury to continue to learn new tools and techniques, to be able to spend time at residencies immersed in my practice, to get to do what I want to do, which is to make my work, work with others and be an artist. I know it’s a luxury. Art is important. Art is culture. Art is politics. Art can expose deep truths. The world needs it. MO: It seems like having that choice and power, to make sure your art reflects truth, is very rewarding especially once the product is finished. MEY: It’s validating and humbling when my work speaks to others. The process of creating and doing is where it’s at for me. That’s where the joy and the education is. MO: What’s been your biggest learning or take away thus far from your career? MEY: I semi-recently learned what it means to take care of oneself and one’s health... You can’t trick your body. It has all the answers. MO: Yeah that’s huge. People don’t say that one enough. MEY: It’s very real. I’m a sensitive person, and I didn’t always like that (or want to admit that) about myself. Now I can see...oh that’s something to embrace. It’s really helped guide me, listening to my body. Both in terms of intuition and physical sensitivities. MO: I can definitely relate to that. Where or what do you turn to when you’re not feeling so well, whether physically or emotionally? MEY: I don’t know who or where I’d be without my friends. There’s some truly great men in that bunch, but it’s the women that I’m really talking about. It’s been so important to have these strong relationships and friendships - they're incredibly fortifying. MO: What’s the most challenging part of what you do? MEY: Time. Having enough hours in the day to do all that I want to do. Not something I can do much about, I suppose, except edit out the little things that I don’t want (or have) to do. When I’m working on a show or towards a deadline, it’s always very clear how much and how often I must say no - so I can make happen all that I want to make happen. It’s a certain kind of bliss for me to be in that zone because I become very good at managing my time and I know how all of it is being spent. But it’s also not necessarily all that social or sustainable either. I’m still trying to figure out how to best manage the in-between times. I like to say ‘yes’ and I think ‘yes’ is as important as saying ‘no’. Maybe the answer to your question is balancing my ‘yeses’ and ‘nos’. MO: You have so much curiosity and determination to learn new crafts or mediums. How do you manage it? How do you choose what’s next? MEY: I like a lot of things -meaning methods of making and materials. I’m not sure if I would have more peace in my life if I did just one of them, it seems logical, but for as long as I’ve been an artist, I’ve had a lot of irons in the fire. I think it honestly stems from curiosity and unapologetically following what I find personally interesting and inspiring. I really enjoy learning new skills, knowing how things are made and knowing how to make things myself, it really comes in handy. When I was younger, I thought it was a character flaw and I was too scattered and none of the paths I was simultaneously on could possibly meet or make sense. But now, I use, in some way, every single skill I’ve ever picked up and I’m grateful for my non-traditional trajectory. I’m way less judgemental of what piques my interest; I embrace my curiosities. I think it’s going to keep me happier in the long run. MO: Did you ever feel like you needed to fit in a box as an artist, or be really good at just one thing? MEY: When I was in school, I felt a lot of pressure to pick one thing, major in it, master it and have that be my livelihood. But I didn’t ever fit into that mould so I never knew how that should look for me, practically speaking. I feel I lucked out in having an internship at the Exploratorium when I was in grad school because it ultimately led to a job there where I was in a constant state of learning and working with and among all kind of generous experts. I grew up there. But pressure to succeed stayed with me when I was long out of school. I was working all the time -at work as an Exhibit Developer, at home as an artist, and in bands playing music and I didn’t know the impact the non-stop working was having on me until I had a serious health thing happen that completely shut me down and made me reevaluate everything. It was a miserable time and I was so depressed and too tired to do anything but go to work so I could afford to live. Finally I realized, ok, I don’t have a choice. I want to feel better and only I can do it and it’s going to take some time, so I need to learn some patience, take it step by step and rebuild from the ground up and figure out how to sustain it. Over that time, it became clear to me that I wasn’t in some kind of race and the pressure wasn’t actually external but self-imposed and I could be an artist however I choose to be and in whatever way that authentically worked. I have a much longer view now, thanks to that experience. MO: How’d you work towards getting better, both at accepting yourself and your work? MEY: That improved as I learned to say no more and prioritize myself and take care of my health in a meaningful way. I had to focus a ton on diet and the stuff that had been going on in my body for years and not strive for “perfect health”, or “perfect” anything. My goals shifted. It became about taking care of myself, listening to my body and slowing down. Saying ‘no’ when my knee-jerk reaction was to say ‘yes’. That’s when stuff started flowing again for me. After this time I realized that the kind of art I had been making was no longer resonating with how I was feeling and what I wanted to produce. MO: Is that because something within you changed through that experience? MEY: Yeah, it just wasn’t where I was anymore. I wasn’t excited about it. It was jarring. It took being away from my daily routine to have the realization that I wasn’t happy with what I was doing anymore and I think, more importantly, to be okay with it. I was at a residency in Finland and had decided before I went there that I wanted my work to change and I wanted to feel connected it it again, whatever that meant. I started doing sketches and playing around in Illustrator, which was a brand new way of working for me, way looser, more forgiving and less labor-intensive. I could see a new body of work coming out of it, even though at the time, I didn’t know in what materials or how I’d make it. That’s when this new series started, and then I couldn’t stop. I guess it took me going through that really dark period to figure out that, in terms of my work, that it’s ok to switch gears and abandon a way of working that no longer feels good. I’m thankful I wasn’t stubborn about it. I have such affection for all of the work that came out of that time period, it really served its purpose. But I’m onto something else now and I’ll keep on this track until it doesn’t feel as good or generative as it does now. MO: It must be especially interesting now to look at your collection of works and see not only your work’s development but also your own. MEY: Sure. It’s so easy to say in hindsight, that you really have to embrace all of the twists and turns that life inevitably gives you -and not have so much judgment towards yourself, but when you’re in it, it seems next to impossible to have that kind of perspective. MO: Lastly, what wisdom might you impart on young creatives trying to pave their way, through the ups and downs of personal and career navigation? MEY: I don’t think I have either. I know what’s helped me is keeping going. Keep making your work and follow the integrity of your voice and clarity of your vision, that feels like decent advice. I mean, to keep moving means something different for everyone. I’m pretty sure on some days it can mean just getting out of bed. I think a lot about facing in the right direction, aligning my actions with my goals. If you’re making choices that are in some way helping you meet your goals, then you’re facing in the right direction. You only have to keep moving.